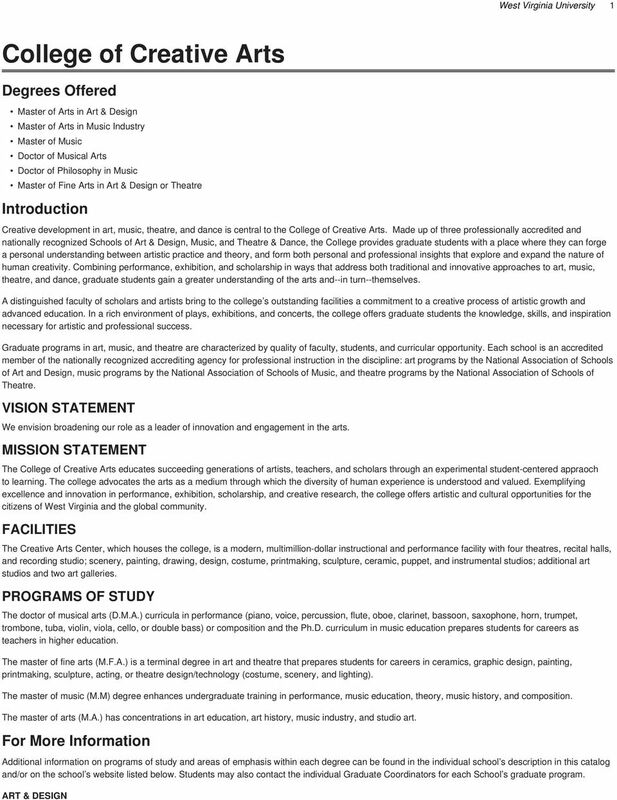 Download "College of Creative Arts"
2 2 College of Creative Arts Graduate Advisor, School of Art & Design Phone: (304) Website: MUSIC Director of Graduate Studies, School of Music Phone: (304) Website: THEATRE Director, School of Theatre and Dance Phone: (304) Website: Written requests for information should be sent to the appropriate Graduate Coordinator and school at the following address: College of Creative Arts, Creative Arts Center, West Virginia University, P.O. Box 6111, Morgantown, WV General information about graduate study and life at West Virginia University can be found at ADMINISTRATION DEAN AND DIRECTOR Paul K. Kreider - D.M.A. (University of Arizona) ASSOCIATE DEAN William J. Winsor - M.F.A. (Ohio State University) ASSISTANT DEAN John Hendricks, III - M.M. 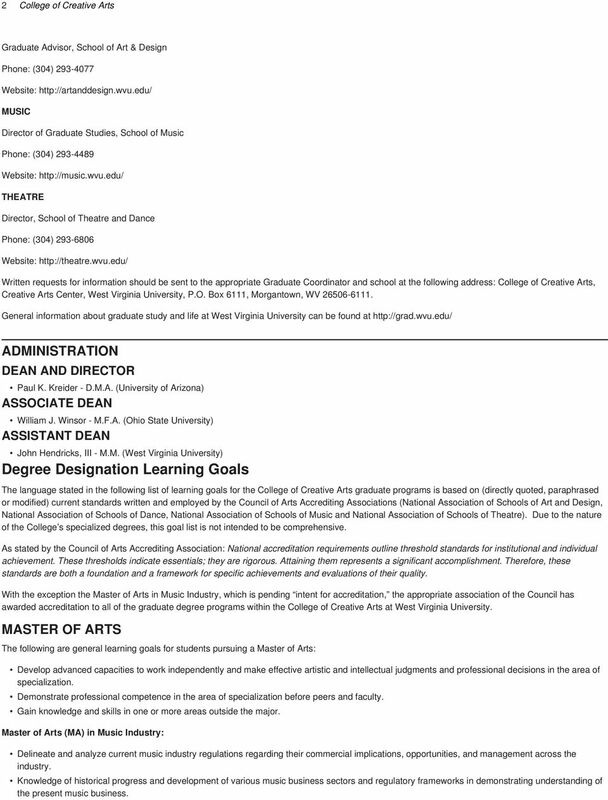 (West Virginia University) Degree Designation Learning Goals The language stated in the following list of learning goals for the College of Creative Arts graduate programs is based on (directly quoted, paraphrased or modified) current standards written and employed by the Council of Arts Accrediting Associations (National Association of Schools of Art and Design, National Association of Schools of Dance, National Association of Schools of Music and National Association of Schools of Theatre). Due to the nature of the College s specialized degrees, this goal list is not intended to be comprehensive. As stated by the Council of Arts Accrediting Association: National accreditation requirements outline threshold standards for institutional and individual achievement. These thresholds indicate essentials; they are rigorous. Attaining them represents a significant accomplishment. Therefore, these standards are both a foundation and a framework for specific achievements and evaluations of their quality. 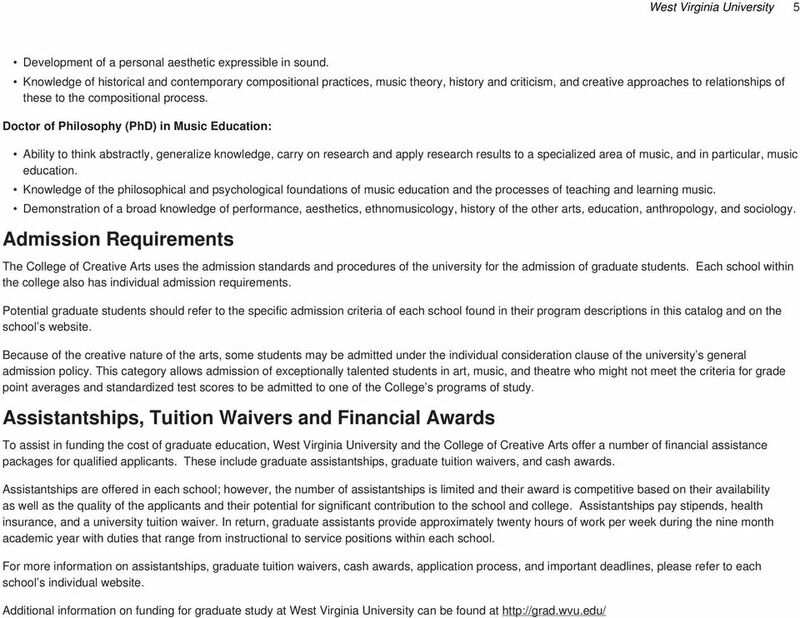 With the exception the Master of Arts in Music Industry, which is pending intent for accreditation, the appropriate association of the Council has awarded accreditation to all of the graduate degree programs within the College of Creative Arts at West Virginia University. MASTER OF ARTS The following are general learning goals for students pursuing a Master of Arts: Develop advanced capacities to work independently and make effective artistic and intellectual judgments and professional decisions in the area of Gain knowledge and skills in one or more areas outside the major. Master of Arts (MA) in Music Industry: Delineate and analyze current music industry regulations regarding their commercial implications, opportunities, and management across the industry. Knowledge of historical progress and development of various music business sectors and regulatory frameworks in demonstrating understanding of the present music business. 2.) Strengthen the artistic skills and problem-solving abilities students need to create successful, thoughtful, individual artwork. Master of Arts and Master of Fine Arts Art: M.A., M.F.A. 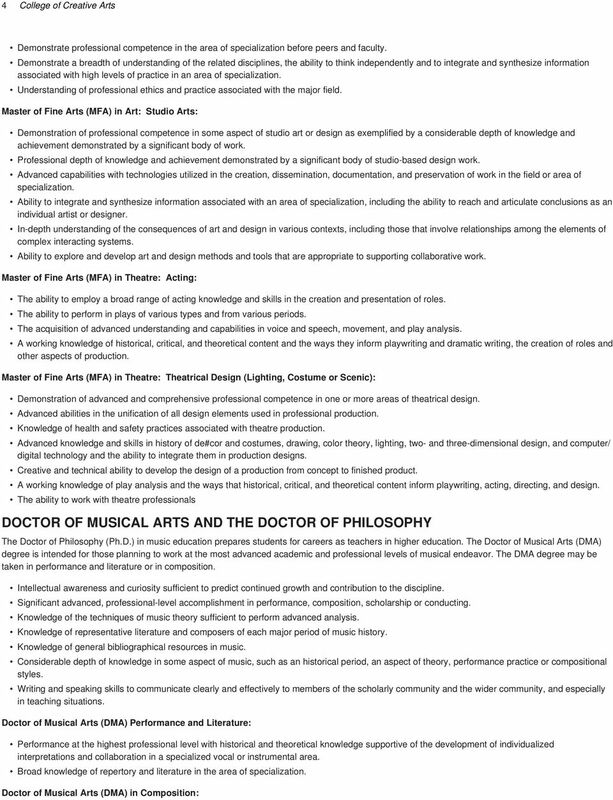 PhD SCHEDULE AND REQUIREMENTS OVERVIEW This section describes the PhD in Theatre & Performance schedule and requirements. Details for the dissertation are provided in the following PhD Dissertation Guidelines. Music at Cashmere. 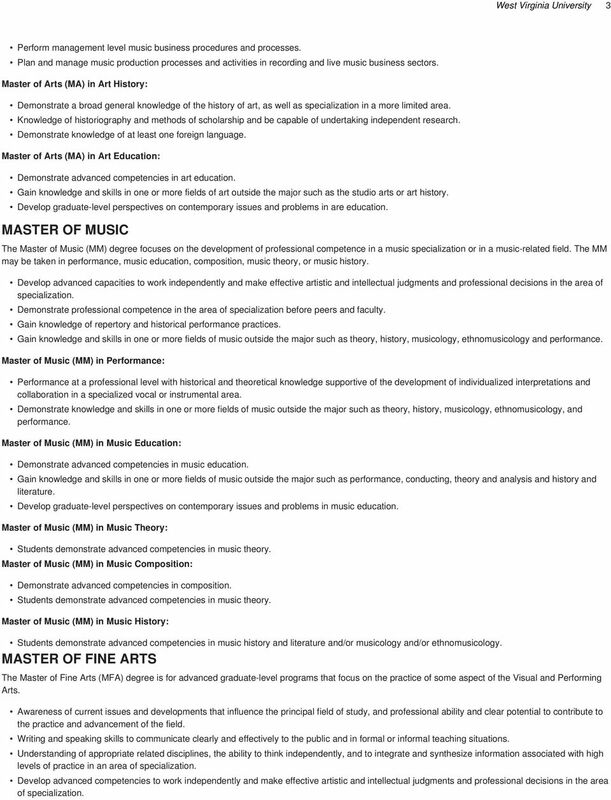 Opportunities in Music: Curriculum Music Music Activities Music Tuition Music Tours Musicals & Concerts Yr.
Music at Cashmere Opportunities in Music: Curriculum Music Music Activities Music Tuition Music Tours Musicals & Concerts Yr. 9 Scholarship Musical opportunities for everyone, striving for excellence. ART. Degrees Offered. Master's Degree Programs (M.A./M.S.) 176 Art. the following sequences, which have additional specified requirements. 176 Art ART 119 Center for the Visual Arts, (309) 438-5621 FineArts.IllinoisState.edu/art School Director: Anthony Crowley. Office: 119 Center for the Visual Arts. Graduate Faculty: D. Barroqueiro, W.
Effective term F15 (use format 04F, 05W) Proposed change leads to the degree of: BFA-VC (Example: BA, BACH, BACJ, HBA, EDD, MA, MBA, etc.